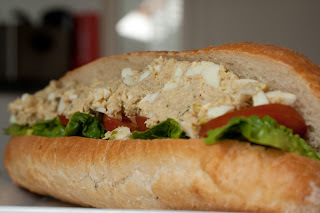 This is a twist on the normal (and quite boring) tuna/mayo baguette. I can't remember where, it but recently I read someone saying: "It's time for the tuna and the sweet corn to divorce!". I took his/hers words to heart and this is what I came up with. Tuna but no sweet corn as far as your eye can see. I served this in a baguette but it could work as well in a pitta pocket or why not as a proper open sandwich on some pumpernickel bread? As always, add and remove ingredients as you see fit - just freestyle it to your hearts content! Flake the tuna into a large-ish bowl. Mix in mayonnaise, curry powder, gherkin, eggs and spring onions until it gets a creamy texture. Slice open a baguette. Line the bottom half with lettuce and sliced tomatoes. Spoon on the tuna mixture and top it with dill and lemon juice.